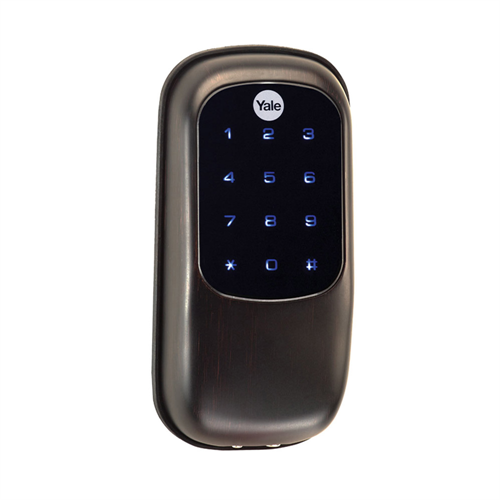 The YRD246-ZW2-0BP Yale Z-Wave touchscreen deadbolt comes with a variety of customizable features. Its ease of operation and set up also makes it a great fit whether you are a beginner or full fledge enthusiast in Smart Home automation. Capable of 25 (250 when connected to Z-Wave network) individual 4-8 digit codes which can be added at any given time, its never been easier to assign temporary codes in the event of a contractor coming to do some work around your home, ensuring that your projects get underway even if you are unable to make it home. Its modern high tech look and feel adds aesthetically to any living space as well as increasing the value of your residence. Available in two other colour options in addition to Oil Rubbed Bronze; Satin Nickel & Polished Brass which can also be found on the Aartech website. The lock is also capable of various wireless features, giving you greater control over knowing who has access to your home and when. Text or email messages can be sent to your smartphone also to alert you of pre-programmed events such as when a certain code is used to access the lock as well as view transactions in real-time or after the fact by viewing when users came of left by time and date. Using a web-enabled device, doors can be locked and unlocked remotely. Imagine being able to check if your doors are locked from the comfort of your smartphone and locking them if they aren’t or if your child forgot their code and you being able to let them in after school. When integrated with other Z-Wave home automation programs, code specific events can be added such as lights turning on upon your entry or a camera could begin recording upon entry into the residence. Door thickness minimum 1 3/4" to a maximum door thickness of 2 1/4"